As I noted yesterday, the CDC has released a number of the Swine Flu genome sequences; they’re available here. (There are more sequences released yesterday.) In my quick and primitive glance at them yesterday, I didn’t see anything very remarkable about the sequences — they looked like more or less straightforward swine flu things. In August 2007, pigs and people became clinically affected by an influenza-like illness during attendance at an Ohio county fair. … Approximately 26 people in close association with the fair pigs were affected by an influenza-like illness. Viruses from at least two individuals were isolated, sequenced and analyzed at the Centers for Disease Control and determined to be nearly identical to the swine virus studied here (A. Klimov, personal communication). The accession numbers for the Ohio virus are EU604689-EU604696. Please see Sandra’s page for her explanation of what she did. However, I am not yet convinced. I ran my own analysis, selecting sequences in what I think is a diffferent, and what I think is a more appropriate, way, and I did not see the present swine flu clustering with the Ohio strain. (See the snippet of a figure at the top left here; click for a larger version.) I am far from an expert in phylogenetic analysis or on influenza virus, so I’m not saying I’m right by any means — but I would like to see an explanation of why my approach is wrong. Basically — as far as I can tell; Sandra hasn’t posted her complete methods as I write this, though that will come later today — the difference between our conclusions may be the way we collected sequences for comparison. She “used H1N1 (and a couple of H1N2) protein sequences from Swine and Humans between Jan 1 2006 and today.” I didn’t try to restrict the sequences in any way — rather, I ran a BLAST search on the non-redundant nucleotide collection in GenBank and selected the top 100 (or 1000) most similar sequences for comparison. To me, it makes sense that we should not artificially restrict our sample, but rather should look at all the closest matches we can find. Unique changes at antigenic determinant sites were identified in the OH07 HA at positions 71 and 162 and may play a role in the loss of cross-reactivity. 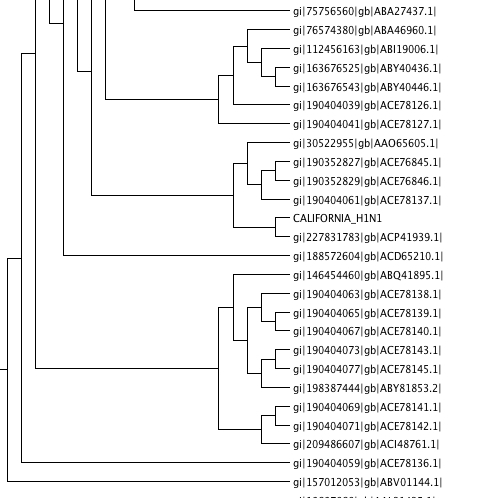 The NA gene was shown to be related to the swine N1 phylogenetic cluster (Fig. 1B). The internal genes (Fig. 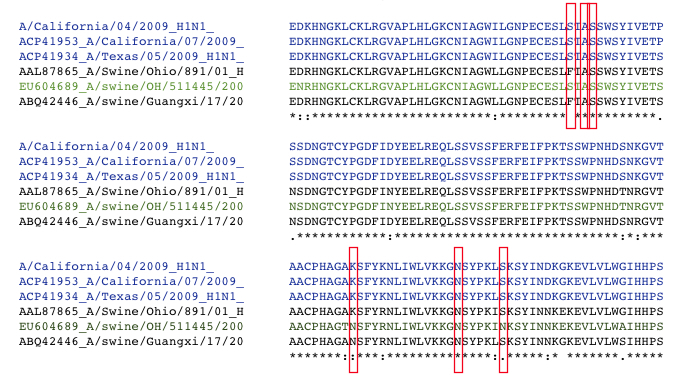 2A–F) were shown to be of the triple reassortant SIV lineage and group with those of the cluster IV H3N2 viruses reported by Olsen, et al. (Olsen et al., 2006). The PB2 gene was determined to contain the conserved avian amino acid residue glutamic acid at position 627, reported to be important in avian and human host specifcity (Subbarao et al., 1993). Right now I need to get my kids ready for school, but I’ll look at those genes later today. Vincent et al (their Table 3) flagged the following sites as unusual; here are comparisons. I ran several from the current outbreak — also a couple of HAs from swine flus that a simple BLAST search identified as highly related to the current outbreak (much more similar than is the A/SW/OH/511445/2007). The figure at bottom shows it graphically (current outbreak in blue — A/SW/OH/511445/2007 in green — unusual residues boxed in red) and the table breaks it down. According to ProMED-mail, the NA and MP genes are related to those of influenza viruses from Asian-European swine, and the other genes appear to originate from swine flu viruses from pigs in North America. The data are in accord with the original assertion of the CDC that all genes of the new isolate were derived from swine viruses. I’ve compared the California and New York HA sequences, and they differ by only a few amino acids. If we assume that the NY strain came from Mexico, this would suggest that the Mexican strains are going to be similar. The increased severity (if that is really true) in Mexico is likely to be due to host factors. I notice a German sequence just came in – from a tourist who had traveled to Mexico. I’m going to do a quick alignment of that now. I wish I had more time to spend on this! I agree that there is not a particularly strong argument for the Ohio strain being particularly close. However, I have made other observations that I’ve detailed in the post — I think there is some tentative evidence for antigenic shift. This is very much a first attempt, feedback would be appreciated. does Mexico only deposit her Sequences at GISAID ? Is it ethical to withhold them ? “their” viruses like Indonesia does for H5N1 ? of this mess when we get swine flu …. Nice Work, But there a fundamental question that recombination will occur in gene level and not the protein (aminoacid) therefore It make more sense to use phylogenic tree or blast based on the genome sequence since the results of comparison by these two method are not completely identical, here are the closest match for canadian SW H1N1 that I found by simple blast. I look forward for your comments.